A monument commemorates the exploration of Hamilton Hume and WIlliam Hovell who camped here in 1824 on their exploration journey to Port Phillip in Victoria. On 8 November 1824 from Big Hill, near Tumbarumba, they became the first Europeans to sight the Australian Alps. In his excitement Hovell wrote in his journal..."a prospect came into view the most magnificent, this was an immence high Mountain Covered nearly one fourth of the way down with snow, and the Sun shining upon it gave it a most brilliant appearance." Explorers Hamilton Hume and WIlliam Hovell camped near Tumbarumba of 8th November 1824. They saw the snow clad Australian Alps, they argued about which direction they should take and then pressed on to Port Phillip. 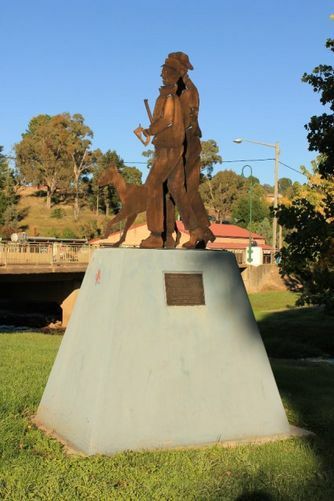 The Henry Angel Trackhead on the Hume and Hovell Track, 8 kilometres east of Tumbarumba, has an interpretive display and commemorates Henry Angel, convict and pastoralist who played a big role in the expedition. This monument was erected during Heritage Week 2001.